Barcamp SG 3 - "How to produce & publish your music album online, practically free, without a music production company or distributor"
Here's what I presented this afternoon at BarcampSG 3. My session started with 5 people. Then more streamed in. In the end, there were maybe 25 to 30 (wish I'd taken a picture at the end). Maybe after today, more will start recording their music in GarageBand and publish their music online. 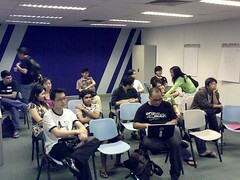 When I ended my 20 minute talk, I asked them "This is my first Barcamp. So what happens after the talk ends? 'Cos you all seem to be just waiting for something." That got some laughs. And this guy in front said, "If we're bored, we'll walk away. We're still here." 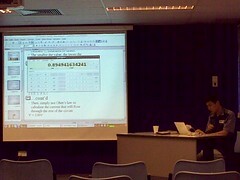 Here are the related barcampsg3 Tweets, Slideshare presentations, and Flickr tags. BarcampSG was an eye-opener for me. 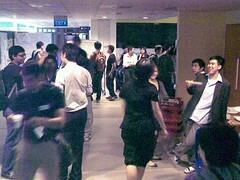 The Singapore barcamp adopts a hybrid format, where some of the talks are pre-scheduled, leaving the rest up for voting on the actual day. At most other barcamps, all talks are determined only the day itself and through public votes. Preetam (one of organiser) tells me this was sort of an "easing in" towards a full voting format. However, I think a hybrid model may work just as well and perhaps something uniquely Singaporean. The average age of attendees seem to be around late 20s to early 30s. I'm kinda considered the "older crowd" I think, though I spotted maybe one or two blokes a lot older than me. Speaking as an "oldie" who's more used to the traditional organised/ scheduled conferences, the barcamp 'Unconference' format was a refreshing change. But it can daunting. The main reason, I feel, is in how Barcamp presentations are "selected". In a traditional conference, speakers get endorsed by a select group of panelists. Only successful abstracts are selected and participants won't know who and what have been rejected. At a Barcamp, any one who wish to speak can submit their topic and have others vote for it. This also means if your topic isn't popular, it's publicly known. To an 'Oldie', I'd imagine this requires a mindset shift. And it takes guts to submit a topic. 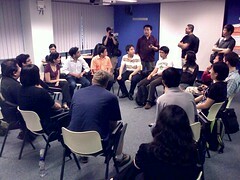 The advantage of this Barcamp format is that the participants have a say in the speakers they want to hear. The disadvantage is that participants tend to vote on the basis of the title only, 'cos speakers don't circulate abstracts. There's no guarantee that the content would match the 'interesting-ness' factor in the title. In truth, I'd be pretty hesitant to plonk my topic on the board for people to vote. But as I said, it requires a mindset shift. The public voting format acts like a messy but effective self-selecting and crowd-filtered system. Only the very passionate, and who are likely to be experts in what they want to talk about, would want to put themselves on the line. And the participants play a part in the success of the event. I've to qualify that I'm a pre-scheduled speaker. 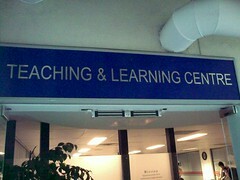 If I haven't experienced Barcamp, I wouldn't have turned up even if I was passionate and knowledgeable. For one, I'm the kind of guy who tend to have too many self-doubts. And yes, my ego is easily bruised. But having experienced this Barcamp, I have a better sense of the atmosphere and expectations of attendees. Most people are pretty nice (I've not read any Tweet about sucky presentations, heh). 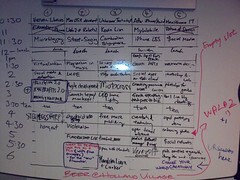 So I feel a hybrid Barcamp model might be more feasible for Singapore, especially ease in Oldies like me. Also, I think it'll be a good balance to have the speakers ranging from the very passionate-but-relatively-inexperienced to the experienced-but-Oldie-mindsets. Or the passionate-but-young-and-hesitant. Oh, another thing I like about Barcamp is that I learned a lot just from conversations that occurred in the hallways. After my presentation, people came up and asked questions. And I learned from them in the process. Which created yet another shift in my mind, from the speaker's viewpoint. Meaning, you don't really need to be Top Of Your Field to be a speaker. I realise now a Barcamp speaker is a Participant, first and last. In a traditional conference format, speakers are usually expert trainers or lecturers. They are expected to deliver information. At Barcamps, the speaker acts as a catalyst for conversations. The talk is just one part, rather than the end, of the entire Barcamp learning experience. This is the first post in a series on The Power of Measurement. In this economic climate, these posts are designed to cover ways to make your website as successful as possible. Over the course of the next few weeks, our in-house Analytics guru, Avinash Kaushik, and others will demystify the world of website analytics and offer tips for getting the most out of your metrics. Avinash's first post of the series talks about the Bounce Rate feature in Google Analytics. And how to improve it (btw, here's a contrasting view about how a high Bounce Rate might be good as well). I found Avinash's tutorial detailed without being overwhelming. Helpful screenshots too. Looking forward to reading more. There are other informative posts from Google's Official Blog, contributed by various Google employees. Like this one on the eye-tracking data Google collected. This post talks about the Google search findings from the 2008 US Presidential campaign. It seems that 12% of inauguration-related queries came from outside the United States. Did you know that "one Google search is equivalent to about 0.2 grams of CO2"? This post shares more. As a librarian, it helps to stayed updated on Google's search features. Like this enhancement to Google's Image Search by allowing searches to search specifically for clip art and line drawings (in addition to Faces, News content, Photo content). I found this post REALLY detailed, and insightful of course, about how Google "trains their search language system". If you ever have to write a paper on how a search engine can help in tackling global pandemics, you might be interested in this post on how Google helps track flu trends. BTW, forget about leaving a comment in the official Google blog. 'Cos they have turned off that feature (I can understand why though). I'm pleased to share with the world the 2nd music album from my band buddy and I (we're otherwise known as Starfish Stories :: The Band. Download links are at our band's blog post. More details of how the songs were put together, here. If you can spare 30 minutes of listening time, we'd be grateful if you'd let us know what you think of the album. Leave us a comment at the blog posts. Barry Schwartz, on “practical wisdom"
At the 3min mark, Barry Schwartz talks about "kindness", "care", and "empathy" as essential qualities to jobs. And how these are seldom stated in the job descriptions. I thought that applies to librarians and other service-oriented jobs too. "A wise person is made, not born". Barry also talks about how wisdom depends on experience. One needs to be mentored by wise teachers. And I thought of the wise people whom I've come across in my life (as well as those who aren't wise, i.e. negative examples). Many of these 'wise teachers', I found them through the public library. The authors and characters from books I've met over the years. Another reason why I think 2009 is the year of "Creative Commons"
I've mentioned how I feel Creative Commons is "the next big thing round the corner". I was talking about music but so far the signs say to me 2009 is going to be the year of CC, period. For one thing, I feel that social media development has been characterised by the introduction and adoption of "tools" and "platforms" in the last four to five years. By tools and platforms, I mean Blogs, services like Flickr and YouTube. Now that these social media tools and services have gained mainstream awareness and use, my hunch is that the next "social media wave" will come from the creative aspects. Creative Commons has been around for several years but it's not really received widespread attention in Singapore, at least that's my sense. A sign of "widespread use" would be more Singapore-based bloggers/ photographters/ musicians adopting and displaying the CC license prominently (if you think I'm missing out on something, I'd be happy to be corrected). There are promising signs though. Like the revamped Yesterday.sg site. They've adopted a CC license. To my knowledge, they are the first (and so far the only) government agency related initiative that has adopted a CC license. I've discussed with a few people about a possible CC-Singapore Contest. What they pointed out rightly was that its hard promote CC as a concept itself. More feasible to start with things that people are familiar with, like "Photography Contest" with CC as context. Music remains at the top of my mind though. Partly fueled by personal interest and also by example like Nine Inch Nails' CC-licensed Grammy nominated album . I plan to put a case to my NLB colleagues to adopt CC license(s) for public library materials that we're already putting online, and where we hope to achieve widespread dissemination. FAQs - "About Being a Librarian"
OK, so this isn't really a FAQ. Since I started this blog in 2004, I've received various "being a librarian" type of questions ranging from career opportunities to whether they'd be suitable for a career in librarianship. This post is more of a compilation of posts from this blog. It isn't intended to provided comprehensive answers. I hope it'll be useful in shedding more light about what "being a librarian" entails. Disclaimer: I am NOT the only public service librarian around. What I do is NOT the definitive Public Librarian job scope. I do NOT blog everything about what I do as a public service librarian (which means there's a whole lot more about public libraries that I've not blogged about here). Part 2 - What does a librarian do? Part 3 - How does one become a librarian? Part 4 - What makes a good (public service) librarian? Part 5 - Why do people choose to become librarians? Part 7 - Why do people remain as a Librarians? Feel free to post your questions at the Librarians-In-Singapore discussion group (more about the group, here). To make an informed choice, one has to be aware. Who are the victims of dating violence? Dating violence is not gender-biased as both males and females are both equally susceptible to dating violence. In local universities, it was found that the rate of assaults by women exceeded the rate by male students by more than 200 percent. Although women reported more victimization than men, male victimization was common too. More men perpetrated sexual violence, but more women perpetrated physical violence and partner violence. The younger a couple is, the higher the chances of violence existing in the relationship. The Dating Violence Awareness week website is at www.chooselovenotabuse.com. This book was published in Dec 2008. On April, 23rd 2007 a series of postings started on Infobib.de, where guest authors from all over the world introduced the library and library related blogs of their own country. This book is a collection of 30 revised LibWorld articles, accompanied by a foreword by Walt Crawford. Included are articles about the blogosphere of: Argentina, Australia, Austria, Belarus, Belgium, Brazil, Canada, Denmark, Finland, France, Greece, Hungary, Iran, Italy, Japan, Latvia, Malawi, Netherlands, New Zealand, Norway, Peru, Puerto Rico, Russia, Singapore, Spain, Sweden, Switzerland, Trinidad & Tobago, USA. The book can be downloaded for free. There's a PDF version licensed under Creative Commons-BY-ShareAlike license (as agreed by the authors). The book started from a series of guest posts at Infobib (the series has since grown). My contribution to the book was from this post I contributed in 2007. I'm humbled and honoured to be part of this book (mine's the entry for Singapore, on page 51). When the Infobib authors sought the permission from contributing authors to be in the book, I readily agreed of course. It's a useful compilation with interesting insights from librarian-bloggers from places like Iran and Japan (who usually don't blog in English). 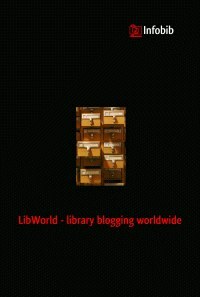 The Infobib authors say: "Our trip through the library blogosphere does not end at this point. So if readers from all over the world would like to enrich our collection, please contact us!" Dr. Cherian George, on "The future of journalism in a post-newspaper world"
Much of what has been written about the future of journalism has come from industry insiders, who tend to focus on the health of news organisations as businesses. This discussion leaves most citizens unmoved. After all, who cares about this quaint, centuries-old ink-on-newsprint product that is already becoming less and less important a part of people's lives. But this reaction misses the point. While some, this writer included, consider good newspapers to be a key ingredient of a high quality of life, they are ultimately important not because of the reading experience they provide. They are important because they have always been the main institutional form supporting the work of large teams of professional journalists. You may not miss ink-on-newsprint much, but you may miss the service of professional journalists much more. The crisis is not that newspapers are sinking, but that we have not yet built a life raft for the journalism profession. It's worth the read. 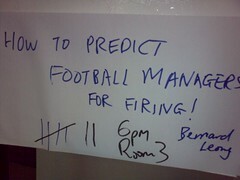 I'd love to be in Dr. George's class. His essay is making me re-think and re-look at the role of newspapers. Preetam informs me that Barcamp Singapore 3 is this month. Asked if I would be interested in presenting - Creative Commons, Music, and "even library stuff". Objective: To bring together Infocomm professionals and also key people working in the energy, media, bio-tech and other industries to collective think of ideas that can be developed amidst the sluggish market conditions. What do people do at BarCamp? All attendees should give a demo, a session, or help with one. All presentions are scheduled the day they happen. Prepare in advance, but come early to get a slot on the wall. Presenters are responsible for making sure that notes/slides/audio/video of their presentations are published on the web for the benefit of all and those who can’t be present. So, every participant is also a presenter eh? Never attended a barcamp before. The 'Rules' and 'What To Expect' part is pretty clear though. I'll share my experience in producing and publishing my music albums. Will cover the "How Tos" on setting up a home studio without costing an arm and leg; How sites like ccMixter (among others) makes it possible for you to produce songs even if you don't play any musical instruments; How to distribute your music online (otherwise known as 'How to shamelessly promote your music'). If there's time, I'll throw in an overview of what's Creative Commons and why it matters.